Ruark scales down flagship radiogram for R5 all-in-one music system | What Hi-Fi? Ruark has announced the R5 all-in-one music system (£999), which bridges the gap between the R4 Mk3 (£699) and flagship R7 Mk3 (£2299) in the company’s illustrious integrated system line-up. 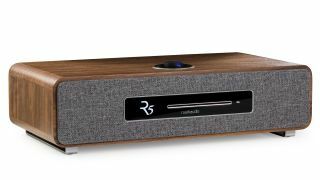 According to Ruark, the benchmark for the new R5 was the top-of-the-line R7. And the inspiration is clear when you consider their aesthetic and feature similarities. Design-wise, the R5 is more or less a smaller, legless R7, with its curvaceous, oblong and appropriately damped chassis, clothed façade and OLED display. That very familiar look is completed with Ruark’s very familiar RotoDial (fancy speak for a volume dial), which makes selecting sources, browsing music and changing volume by hand effortless. We’ve always liked it as an on-unit alternative to the supplied remote control and Ruark LINK app (iOS, Android), so we're pleased to see its return. What’s even more appealing, though, is the R5’s exhaustive connectivity, which spans – deep breath – a built-in CD player, aptX HD Bluetooth, DAB/FM and internet radio, and wi-fi for streaming networked files and streaming services such as Spotify, Tidal, Deezer and Amazon Music. There are also RCA, USB and optical connections and, last but in no means least, a phono input for a turntable hook-up. Everything but the kitchen sink? Pretty much - but then we’re used to fruitfully-featured systems from Ruark. As expected, the R5 also boasts multi-room functionality, meaning it can be wirelessly grouped with another R5 or Ruark’s MRx, R2 Mk3 and R7 Mk3 models to offer synchronised sound around the home. Newly developed Class A-B amplifiers drive 80 watts to each of the R5’s built-in speakers, which see a neodymium magnet system coupled with a lightweight cone/coil assembly to create Ruark's signature sound. Its latest processing works to create a stereo image akin to that produced by separate stereo speakers, too, and the down-firing, long-throw subwoofer underneath the chassis aims to bring apt brunt to the presentation. The Ruark R5 (£999) will be available in spring in a choice of walnut and grey lacquer finishes.